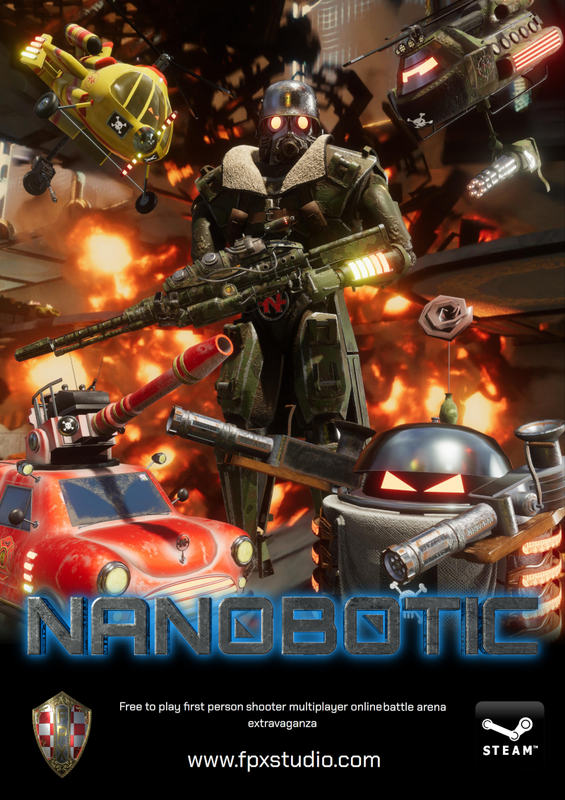 Nanobotic is a free to play first person shooter multiplayer online battle arena extravaganza (FPS MOBA). In Nanobotic you can craft weapon elements on the spot and switch between them with ease, you can also craft different types of artificially intelligent (AI) minions and control their actions. “This game is in constant development. “The game was developed to be Free-to-Play and we plan to keep it that way. Even though we planned the release for the end of November, we had to push it after initial tests. We are in the process of final tests before the release now. If you want to be part of the closed testing, join us on Discord. We invite everyone to join Nanobotic on Discord, and the official subreddit /r/Nanobotic. We didn't come empty handed. Here is a beautiful Nanobotic weapon transformation. In the far, distant future, the year 3019, our world has long been taken over and destroyed by Nanobots. After a Nanobot experiment went wrong the entire planet was disintegrated in a matter of nanoseconds, more specifically 35530 times 10 to the power of 9 nanoseconds. These hive minded, super intelligent, nanoscopic robotic beings have the ability to render anything imaginable in an instant, from the environment surrounding them to raging means of mass destruction. In a world of tomorrow, having ultimately replaced all lifeforms, they were left with no purpose for ages and began waging endless warfare amongst themselves. Being manifested as heavily armed robots, they fight on ever shifting battlegrounds, wielding plentiful weapons that transform in a blink of an eye, each specifically designed for any need. Luckily, during the great Nanobotic disagreement, a rebellious minority discovered the way to contact human race back in the present time through a wormhole. Unfortunately due to the wormhole's bandwidth limitations of ~191980 bits per second, they're able to transfer only small amounts of data but enough to be visualized as computer graphics. Thanks to that achievement, humans in the present are able to control robots in the future through a video game. Join the rebellion now, help reprogram the nanobots to revert Earth to its former state. Nanobotic is a first person shooter multiplayer online battle arena (FPS MOBA). Teams consist out of 5 players whose goal is to reduce an opponents' Base building to a crumbling ruin. To achieve this feat, the players have to clear a couple of rooms along the way by destroying the Turrets that protect them. In Nanobotic you can craft weapon elements on the spot and switch between them with ease, you can also craft different types of artificially intelligent (AI) minions and control their actions by interacting with them. Nanobotic features procedurally generated levels with fully destructible environment. Game will be free to play. The entire Nanobotic universe revolves around utilization and management of your primary resource - Nanobots. To put it simply, Nanobots allow you to generate many different weapon elements and your personal squad of robotic minions. Each time you manage to land a shot on your opponent, you will be awarded a certain amount of Nanobots based on where the shot landed and how much damage has been afflicted in doing so. In Nanobotic you can craft and combine weapon elements to deploy anything from traditional bullets, remote controlled poison bombs, all the way to rockets which heal on impact. Upon release, the game will feature 120 possible weapon combinations, and that number will drastically increase over time. Each game you start off with the most basic weapon, inflicting the least amount of damage and having no special effect, but with no cost of Nanobots for ammunition. For any other weapon you craft, Nanobots will have to materialise a projectile upon firing at a certain cost. Crafting weapons is an action that you are able to perform anywhere, even in mid air if for some reason you wish to do so. Weapon elements which you crafted will automatically be added to your roster, enabling you the luxury of being able to combine and switch among them at any time you deem fit for your strategy. Both crafting and reconfiguration of your weapon can be achieved swiftly by using dedicated keys on your keyboard separate for elementals, barrels, activation systems and so on. Nanobotic universe at the moment allows for two different types of characters that differ only in the way of movement. Blueprints for weapon elements and minions that are available for one are also available for the other, so there aren't any of the class based shenanigans at play here. More characters will be introduced in future. Nanobotic universe features many blueprints upon which different types of robotic creatures can be crafted out of Nanobots. There are different types of minions, defining their way of movement and weapon systems as well as many different types of passive features that are applicable to them. Such features include healing properties, generating a protective force field, exploding upon death and so on. Interacting with minions allows for more control of their actions, having them follow you, move to a certain position or to hold that position as long as their health indicators are above zero. Each team's base is equipped with a main building which along being the final destruction objective of the opponent's team acts as a Bank as well. It contains shared Nanobots deposited by your teammates for the greater good of the team as well as those acquired by your teammates' minions, and turrets, who have successfully managed to hit their targets. You are free to use as many Nanobots from the bank as you need to craft yourself different weapon elements or minions. Being a hostile place, Nanobotic environment contains plenty of destructible and restorable elements. Chances are, if you see something, you can destroy it, and if you can destroy it, you can restore it. Reasons for doing so may be accidental or strategic, as some places are normally blocked by barriers or can only be reached by stairs which are, you guessed it, very much destructible. Destroying environment elements, as well as restoring them may lead to awards in the way of Nanobots. Player characters, minions and weapons come in a variety of different skins, which only affect their appearance, sound, animation, and nothing else. Weapon skins are dictated by a Player character skin, but minion skins are available to any Player character skin. Nanobotic will run on dedicated servers. Entirety of the game is simulated on the servers, giving you the best and fairest experience possible. Nanobotic encomporates fully procedurally generated levels, as it's composed of smaller building blocks. Random level generation is still in development, so the first version of the Early Acces game will have limited variety when it comes to the randomnes. That limit is a compromise we took to provide smoother and more comprehensive gameplay experience for the players. We will improve on this technology in the future. Thanks to the awesomeness of FMOD Studio audio engine, we are able to deliver procedurally generated sounds as well. Each of the sounds you hear, whether those are shot sounds, footsteps, destructions or anything else, sound different every time you hear it. We have developed our own sound occlusion technology, which allows for sounds hidden behind the objects being heard differently from those in the direct line of sight, and the occlusion depends on the barrier's acoustic permeability. We have also developed a solution for dynamic reverb zones, dependant on environment's size and the listeners position relative to the walls.